Etiquette Creative and the Design Your World team are hosting our very first Electronic Fashion Camp! 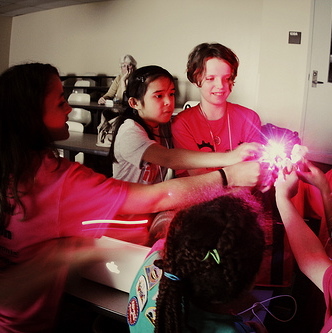 In this three day, hands-on camp, girls will learn about fashion, electronics and coding using the LilyPad Arduino. Girls will discover how microcontrollers work then create their own electronic fashion project using the LilyPad Arduino, a sewable microcontroller that bridges the traditional technology and arts divide. The camp will be held August 1-3, 2012 at Oil & Cotton. We're looking for smart and courageous young girls, ages 12-14, to come experiment with female engineers, technologists, media experts and fashionistas to create one-of-a-kind LilyPad Arduino projects. Breakfast and lunch will be provided. Registration is $95 per girl for the entire three day camp plus materials, payable online or by check. Any parent volunteers/chaperones that would like to stick around and help out may do so for $35 to cover the cost of food.